Have you ever gone somewhere feeling like the world has conspired to frustrate you and after interacting with other people and listening to their sorry stories, you ended up feeling so ashamed of yourself for thinking you had it bad? Well, that's what I felt last week when I met a lady who had every reason to give up on life, but instead, she had this joyful and bubbly look around her that made one think she lived in paradise; until she shares her story with you. To sum it up, she has been married to her husband for over twenty years and together they have four children. The first born who is twenty-five years of age recently got married, while the siblings who follow him are in college. Together with her husband, they had saved up enough money to buy a piece of land on which they built their residence on one side, and commercial houses on the other. Since they moved into their own residence its been about a year. The lady being a landscaper had really created a nice natural ambience around the compound, making their residence a very comfortable place to live in, until the usual spoiler stepped into the scene. The usual spoiler in this case refers to "the other woman". Now that the husband has some worth attached to his name, it has come out in the open that he has hooked up with a "better woman". I know it's none of my business but I can't help but wonder what criteria the man used to make this decision. Well, I guess it must be the private dances this "new woman" has been performing for the man because it seems he is so hooked to her to the point that he openly told his wife he needs her out of their bedroom so that he can enjoy his new "catch" at his convenience. But seriously, how do some men reason (if at all they do)? Your wife puts up with all your crap for all the years you've been together, she suffers with you through your years of having nothing, and then, with her great help, strategies, patience, sacrifice and lots of prayers, you finally get out of the woods and how do you repay her? By bringing some loser into your wife's bedroom? I'm sorry but I think men like this should be castrated because it seems they use the wrong head to think! Even if you are having marital problems, that's not the way to deal with them. Why didn't this man do this when he was a sorry, miserable pauper? Such an opportunist! Going back to my story, with this situation at hand, the woman has decided to leave her marital home, forgetting all the investment(s) she had made in terms of time, money and other resources, the latest of them being the finances she put in to help build their home and other businesses. Now, if you were in her shoes, what would you do? How would you react? Would you even see a reason to be joyful? This is the woman I met on Friday and after she shared her story with me, I realized I had a lot to be thankful to God for. I met her at a saloon where I had gone to have my hair done. She was previously an employer and a business owner in the real estate business she had worked so hard to help her husband build. Now here she was, working in some small hair saloon as a casual laborer, who gets paid based on how many heads she braids. What a shift! Many people in her shoes would be thinking of revenge and murder, if not suicide. As for this woman, she told me something I will not forget in a hurry. To paraphrase her, this is what she told me, "as long as he did not take my brain, as long as he did not take my life, this is just a temporary situation for me. I built him an empire from scratch, I can do it again, only this time I will be doing it for myself and my kids. I will not let my current situation and circumstances put me down. Though I know it will be tough, I will pick myself up, beat all these odds and get to the top again." As I left that saloon that evening, I obviously had a lot on my mind. Life can be extremely dark, very tough really, it can be unfair, it is not known to be just and it definitely is very unpredictable. It throws curved balls our way, swings "below the belt" kind of blows that leave us writhing in pain and laboring for breath, and if we are not strong enough, it is possible for us to give up and quit trying. However, it is possible to bounce back again from tough situations. It may take time, but with determination, self-believe, discipline, focus and total trust in God it is doable. Yes it is not easy having to start from scratch again but it is doable. I've been down that road myself and I speak from experience when I say it won't be easy, but with the right ingredients it can be done. There are many people right now going through different disheartening, discouraging and disappointing situations. Such is life. However, you don't have to succumb to those situations. You can decide to beat all those "dis" odds by being determined not to lose hope. You can decide to see them as waves and as surfers do, ride those waves and emerge victorious. Like the eagle in the sky, you can decide to see all the storms in your life as the perfect chance to glide through the skies without using so much of your flying power. However, deciding is one thing, but determining to take the necessary steps in order to change your situation is another. If I may use the woman in this article as an example, the first step she made is accepting that life had happened to her in the form of her husband's unacceptable behavior. She decided that though she had put a lot into their marriage she was not ready to be undermined by some opportunist of a man, and so, she decided to jump out of the sinking ship. She said it herself that she knows it won't be easy but she knows eventually she will succeed and recover everything she had lost, if not get better. This woman is a star in my eyes. You see, try as you might, during the day you cannot see stars in the sky with your own naked eyes. 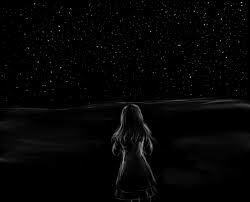 However, as soon as it is dark the stars shine bright, and the darker it becomes, the brighter the stars shine. This woman is at a very dark time in her life but she is shinning bright right now for opting not to revenge or fight her husband though she has every reason and right to. She has decided to fight this war in a different way, and I know she will win it eventually. What war are you fighting today? Whatever it is, decide you'll do whatever you can to win it, as long as it is right, it is legal and it is doable. Don't just sit there and feel sorry for yourself. Pick yourself up, dust yourself off and start all over again. As I come to the end of this article today, I leave you with Maria Sharapova's words: "It's always tough when you lose - you've been working so hard for that moment and it hasn't gone the way you wanted. But you have to realize there's always a bright side. You have to pick yourself up and get ready for the next game..."
May you focus on the brighter side of life always. PS: Article published in Tanzania's Guardian on Sunday on the 1st September 2013, under my weekly column "Thoughts in Words"
a very heart touching story "wild women use brainless men to hurt domestic women".. it`s too hot to handle such situations.